As a growing field service business, you might operate with fly-by-the-seat-of-your-pants, trial and error methods. And that is perfectly fine! Plenty of entrepreneurs and business owners are entering uncharted territory. They might have never dealt with customers the way they need to now that they run a business. They might have never held a sales position before, but since they’re responsible for growing the business, they have to sell now. And many have never had bookkeeping experience. They have to learn as they go, otherwise they won't be able to grow. I asked our sales reps recently what was one of the biggest reasons why field service businesses were hesitant to try using software to help run their daily operations. They hear from business owners all the time that they “just aren’t big enough to use software”. That, in their mind, they’re just a small business that doesn’t have the need for field service software. But many of these 5 man/woman operations have the same needs as the larger companies that have 50+ employees. They all need to manage customer information efficiently, no matter what size they are. Each business needs to invoice and manage customer payments. And as a field service business, it doesn’t matter how many employees you have, you need to route your field technicians out to their jobs as efficiently as possible. No matter how many employees you have, no matter how much revenue you do in a year, software can help you take your business to the next level. Here are a few reasons why software is a smart investment, even if you are "just a small business". One of the main reasons that business owners don’t think they’re ready to take the leap into field service software is that they aren’t big enough to need it. Many of these “small” businesses are able to operate using paper processes, they might be able to get by without keeping detailed customer records for the time being, but that isn’t scalable. As they grow, paper records become unmanageable and they struggle to take their business past a certain point. 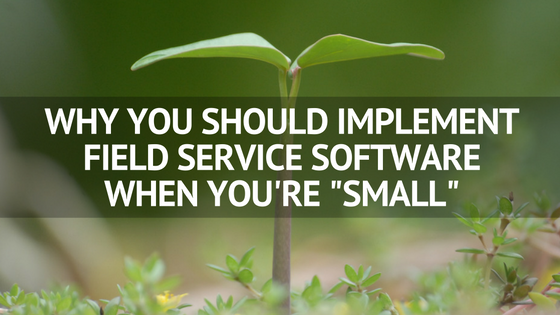 Implementing field service software helps you to put scalable practices into place early on. Instead of working with inefficient processes, you’re building something which can grow with your business. Your field techs become used to taking notes in the field, keeping track of their time on jobs and any improtant part information which they've used. Having the ability to manage data from a very early stage enables you to grow the right way. Managing customer information on paper might work for the first year or two of business, but it doesn’t allow you to scale. There is only so much information that you can maintain before it becomes, for lack of a better term, a mess. Even if you feel like you’re too small to have a business software in place, there are situations in which it will help you to grow instead of just getting by. Data management is an important piece of most successful businesses today, not just field services. Companies need to manage their customer data in order to plan and predict future needs. Many businesses don’t implement software because they feel like they’re not going to grow the number of employees they have anytime soon. However, that isn’t the right mindset to have. Field service software enables you to do more within your business with less employees. Many of our customers have told us that they have been able to accomplish more and have grown their customer base without bringing on any additional staff. Not only is their office more efficient, their field employees have been able to, on average, get one more job per day done, per tech than they were able to before implementing software. Want to learn how HindSite can help your business grow? Watch the demo and see how we can help your field service business!